National nonprofit, Soldiers’ Angels, is looking to collect 17,000 pounds of excess Halloween candy to share with service members and veterans. Every year, thousands of pounds of excess Halloween candy are dumped into the trash after the holiday is over. From kids collecting more than they can eat to parents having more candy than trick-or-treaters, soon after the fun is over, the candy ends up in the garbage. This year, instead of filling your trash can, consider donating your excess candy to the Soldiers’ Angels Treats for Troops Halloween Candy drive! Through this great annual initiative, the national nonprofit collects excess candy and ships it to deployed service members in care packages for a sweet taste of home. The organization also uses their vast network of volunteers to hand out the candy to veterans in VA Hospitals across the country. Businesses across the country are encouraged to participate by becoming an official drop-off site for the Soldiers’ Angels Treats for Troops Program. Participating businesses will not only be serving their local communities by removing excess candy from landfills and the mouths of children, but they will also be giving back to our service members, wounded heroes, and veterans. To get started, visit http://www.SoldiersAngels.org/TreatsforTroops and register your business today! For those parents looking to drop off their extra candy after the holiday—you can search for a drop-off site at http://www.SoldiersAngels.org/TreatsforTroops. Enter your zip code and preferred radius to find the location closest to you. New locations are added daily. If there is no location close to you, there are instructions on the site to contact Soldiers’ Angels for an address where you can ship your candy. This year Soldiers’ Angels hopes to collect 17,000 pounds of candy for our troops and veterans. 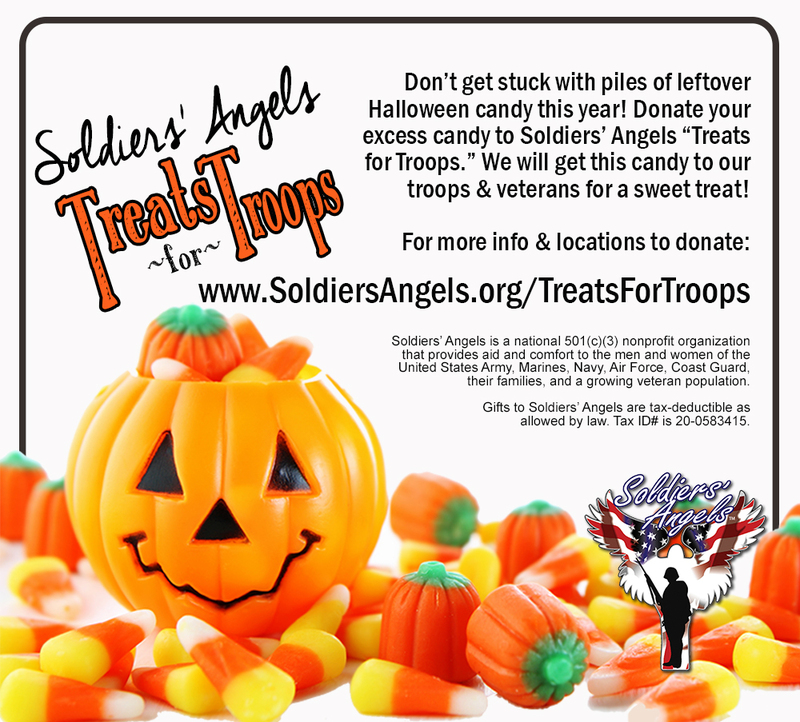 For more information on the Treats for Troops program, visit the Soldiers’ Angels website at http://www.SoldiersAngels.org/TreatsforTroops or email inkind(at)soldiersangels.org.